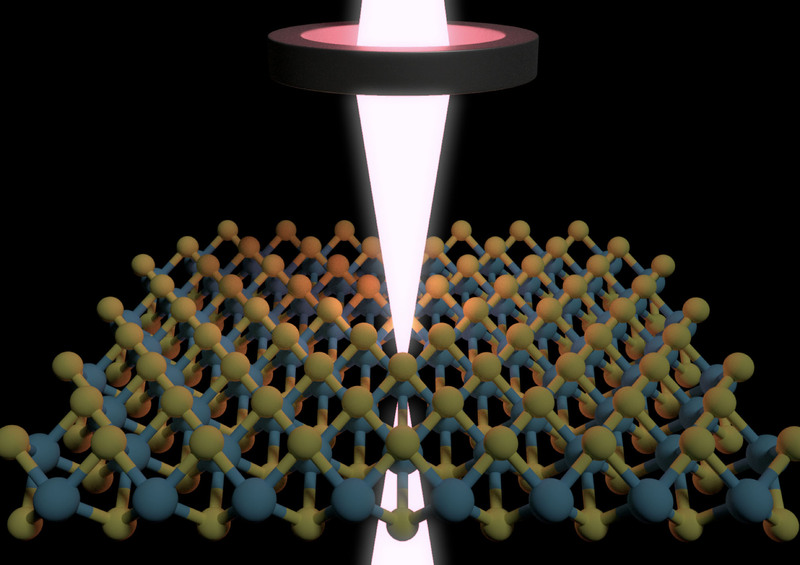 THE ABOVE PICTURE, PROVIDED by PhD student Anthony Yoshimura, depicts the interaction of an electron beam with a two dimensional layered material. Passionate about physics and computational methods, Professor and Head of the Physics, Applied Physics, and Astronomy Department Vincent Meunier works to optimize materials at their lowest level, playing with atomic structure to maximize their electronic properties on a quantum scale. Supported by a team of graduate and undergraduate students, Meunier is driven by a need to understand quantum phases of perfect materials and explore the benefits of these properties in applications of energy storage and transport; these can improve our standard of living through the betterment of areas like water desalination and computing power. His research is based in two dimensional materials, which are often defined by only one or two layers of atoms. One of Meunier’s most recent projects is related to Moiré structures in bilayer graphene. Such structures are formed by rotating one graphene layer with respect to the another, creating a superposition which is found to introduce enhanced electronic properties. Specifically, Meunier is interested in studying how these structures affect electron coupling—a transfer of energy from one medium to another. Meunier and his team work closely with experimentalists at Rensselaer to optimize research in the field. For instance, Meunier works with Nikhil Koratkar from the Department of Mechanical, Aerospace, and Nuclear Engineering and Bruce Watson from the Department of Earth & Environmental Sciences. “What’s difficult experimentally is building the structures … we narrow the scope,” Meunier says. His group virtually screens various structures by determining if a given material is stable, how it can be built, and which properties may be extracted. Ultimately, Meunier and his team determine whether a given material is worth exploring. A challenge Meunier poses with his line of research has to do with explaining the unknown. “Most of the exciting stuff was hidden in the noise and with the advent of new synthesis methods … we have significantly reduced that noise,” Meunier explains. A clear understanding of where atoms belong on a perfect structure opens the door to new, unexplained phenomenon in electron-photon coupling, electron-electron coupling, and lattice and light coupling. This challenge to “create something bigger than sum of the parts,” however, is a large motivating factor. In addition to his explorative and cutting-edge research, Meunier is excited to work with undergraduates. Including at least five undergraduate students at any given time, Meunier welcomes undergraduate participation in the field and in research. He adds, “This is a group effort,” when speaking to valuable contributions made by undergraduates in his group.